I was almost not bothering with trying to get away for a walk this weekend, but then my beloved announced that the house was a complete tip - one could, apparently, "stir the dirt with a stick"(!) - and she was going to give it a proper clean at the weekend. That, needless to say, is code for "I need you out the house." 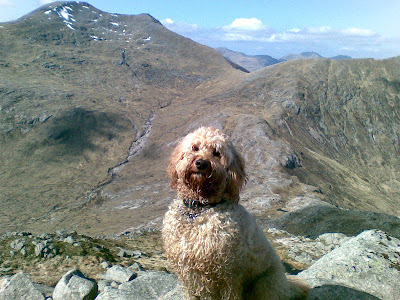 So me & Andy headed for Glen Etive. The forecast had suggested it would be better in the West than the East, and we had a notion that we could have a go at Beinn nan Aighenan, going up by the descent route we used when we did Ben Starav. That would also give us the option, when we returned to the col at the Starav/Glas Beinn Mhor/Aighenan junction of turning right and pressing on to GBM. That's the one I did with Gordy a few months back. I wouldn't even have considered it again if it was going to be as cold as last time. Turned out that Molly was the only dug to come along, and she had a great time. It was quite a good jaunt for her, because the paths tended to hem her in, so she didny feel obliged to tear around daft like Jorja does. 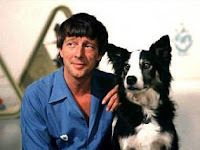 She disny have the Wee Black Dug's stamina. Also, there were innumerable pools, or ponds, or tarns, or tiny lochans (whatever you want to call them) virtually all the way to the top, so she was never in danger of dehydrating. The weather was perfect; the views were breathtaking. Photography couldn't do them justice. Luckily I had forgotten my camera anyway. It is though, in all seriousness, a remarkable viewpoint when the visibility is so good. We're not the best at working out hills visible from other hills, but even we could pick out Vorlich, Stuc a Chroin, Ben More, Stob Binnein, The Ben, the Blackmount hills, Ben Dorain, Achaladair, Sgulaird, Ben More on Mull...etc, etc. As well as the ones that were in Glen Etive and Glencoe, of course. Basically, you could see most of Scotland, even if you couldn't name the bit you were looking at. Remarkable. Quite humbling, in an odd sort of way. I did get a few blurryish photies on my phone, but they don't do anything for the reality of what we were seeing. I quite liked this one of Molly posing like mad in front of Ben Starav though. 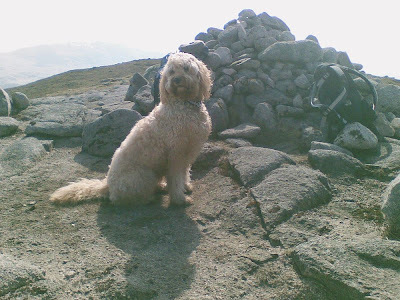 And this one of, er, Molly posing like mad on the summit.